Your residential search resulted in 44 properties found. Electric gates lead you to this private and beautifully presented 5 bed detached house having undergone extensive renovation and now offering luxurious and spacious accommodation. Enjoying a mature and larger than average plot of approximately 0.5 of an acre and situated on one of the areas most sought after avenues, the property includes 3 reception rooms, large breakfast-kitchen with open plan dining room. Conveniently located within easy reach of Junction 19 of the M62 motorway and a short walk from primary and secondary schools. Viewing is strictly by appointment only. 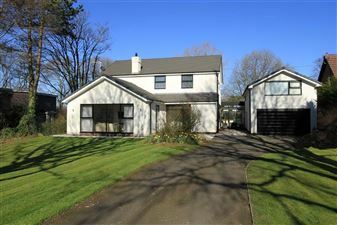 The accommodation comprises, on the GROUND FLOOR: imposing L-shaped HALL with storage cupboards below staircase; CLOAKROOM leading to WC; LOUNGE to front with large picture windows, Faber gas fire and display shelving; SITTING ROOM with patio door to garden; BREAKFAST-KITCHEN with attractive range of Shaker style units, granite worktops and a comprehensive range of appliances and large island unit/breakfast bar; WALK-IN LARDER with sink unit dishwasher and shelving; DINING AREA, open plan to the kitchen and with superb views over the garden having wall-to-wall glazing with sliding doors; FAMILY ROOM with cinema area, Faber fire and wall-to-wall glazing with sliding doors; UTILITY ROOM with access to the DOUBLE INTEGRAL GARAGE with remote controlled door; 1ST FLOOR BEDROOMS 4 & 5, both double rooms plus BATHROOM with modern suite comprising bath with shower, WC, washbasin and vanity unit. FIRST FLOOR LANDING has a large window taking in the view of the back garden and storage cupboards; the MASTER BEDROOM has a range of fitted furniture and window/patio door to the rear plus a beautiful and spacious EN SUITE comprising roll-top bathtub, large shower cubicle with plumbed shower, WC and twin washbasins; BEDROOMS 2 & 3, both large double rooms with fitted furniture; family BATHROOM comprising Phoenix spa bath, large shower cubicle, washbasin WC and TV. Freehold; Built in 1972 ; Council Tax Band G; Gas central heating with unvented hot water cylinder, uPVC double glazed.